It consists of six lessons that are each approximately 60-minutes in length. For some of the lessons in this unit, students explore materials at various stations. Additional adult supervision at some of these stations would be beneficial. To explore the properties of materials and develop vocabulary to describe them. To identify the material objects are made of and to sort them in various ways. To develop an understanding of the suitability of certain materials for different purposes. To understand that some materials provide better shade than others. To understand that some materials are more water resistant than others. This Science unit provides excellent opportunities for cross-curricular integration. Look for ways to meaningfully integrate the content of the unit with other learning areas such as Reading and The Arts. 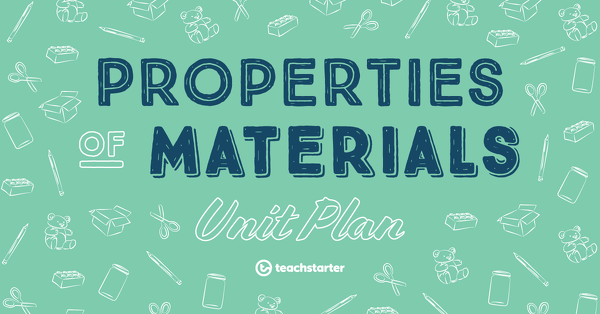 Prior to starting the unit, develop a classroom display that focuses on the properties of materials. Display word wall vocabulary and learning goals that the students will engage with throughout the unit to stimulate their learning. For examples of additional teaching resources to display in your classroom, browse the Material World collection on the Teach Starter website. Many of the resources that accompany this unit plan will need to be prepared prior to teaching. For this reason, it is advised that teachers browse through all lessons before starting the unit. It is suggested that several weeks prior to starting this unit, a note is sent home to parents asking students to bring in recycled materials to be used throughout the unit. A large variety (and quantity) of resources will be needed for exploration and construction. This will take some time to collect and arrange, however, some of the resources can be re-used several times throughout the unit. A 60 minute lesson in which students will explore the properties of materials and develop vocabulary to describe them. A 60 minute lesson in which students identify the material objects are made of and sort them in various ways. A 60 minute lesson in which students develop an understanding of the suitability of certain materials for different purposes. A 60-minute lesson in which students investigate materials to determine how much shade they each provide. A 60-minute lesson in which students investigate materials to determine how water resistant they are. A 60-minute lesson in which students design and create a three-dimensional monster using materials with different properties. A template to use when describing objects by touch and sight. Forty-eight properties of materials vocabulary cards. A template to use when sorting objects using the sense of touch and sight. A 16-slide teaching presentation to use when exploring the properties of materials. A fun sorting activity for students to explore the materials objects are made of. A set of 6 templates to use when investigating the properties of materials. A whole class game to play when learning about the properties of materials. A science experiment that explores the absorptive properties of materials. A reflection worksheet for students to use after creating a three-dimensional monster. A design activity to use with students when learning about properties of materials.